Akron singer-songwriter Angie Haze is collaborating with dozens of middle school students for a concert this weekend. The Bigger Picture Project aims to connect Akron’s music scene to the schools. Haze is known as Akron’s one-woman band. Her home studio is lined with every instrument you can think of, from guitars and mandolins to keyboards and kazoos. And she’s taught herself to play them all, including her signature tambourine shoe stitched together with pieces of suede and fur. 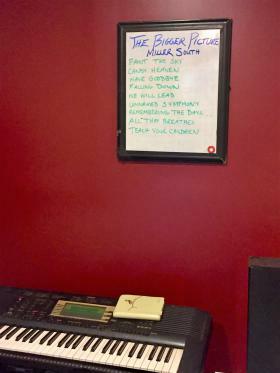 On the wall is a dry erase board with nine song titles and “THE BIGGER PICTURE” at the top. It’s the set list for this weekend’s concert. “The arts, and especially music, literally saved my life and if I can just provide that sanctuary, that’s everything,” she says. On Saturday, Haze goes from solo to a band of about 80, all under the age of 13. 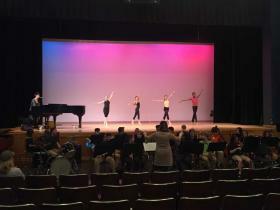 They’re students at Akron’s Miller South Performing Arts School, who’ve spent months learning her songs, choreographing dance routines, designing paintings and rehearsing skits to perform alongside her. It’s the second year for Haze’s Bigger Picture Project that she created to emphasize the importance of the arts in schools. Last year, about 50 students auditioned and worked on the project after school. Now, it’s integrated into Miller South’s curriculum, so they’re learning Haze’s songs in class. Organizer and parent Eden Kozlowski says they’ve also gotten sponsors to make the project even bigger. While the students have had to learn her songs, Haze has had a lot to learn too. She doesn’t read music — she plays strictly by ear. Last year, she showed the kids how to play the songs, but this year she had to use software to draft sheet music. Miller South’s students have spent hours this week perfecting the songs. Band Director Marissa Hughes says the project has given her students the experience of collaborating with a working musician. “They have their idols in the pop world and the rock world and I think for them it’s cool for them to see that poplar music today can be instrumental and have real things; it’s not just all phony-baloney stuff,” she says. Haze says she envisions taking the Bigger Picture model on the road. The Bigger Picture is Saturday at 7 p.m. at Akron’s Miller South school.